INTRODUCTIONS 5 05 SAFE & POWERFUL HAIR REMOVAL 6 Offer safe and effective permanent hair reduction to a range of skin types—up to skin type V—with the Sciton Forever Bare BBL. The device—which is available on Sciton's JOULE platform—features the company's BroadBand Light Technology (BBLTM) and uses continuous movement and multiple lower-ﬂuence pulses at a high repetition rate to evenly heat follicles to a precise temperature. A thermoelectrically cooled sapphire crystal on the handpiece provides continuous skin cooling before, during and after treatment for added patient comfort. 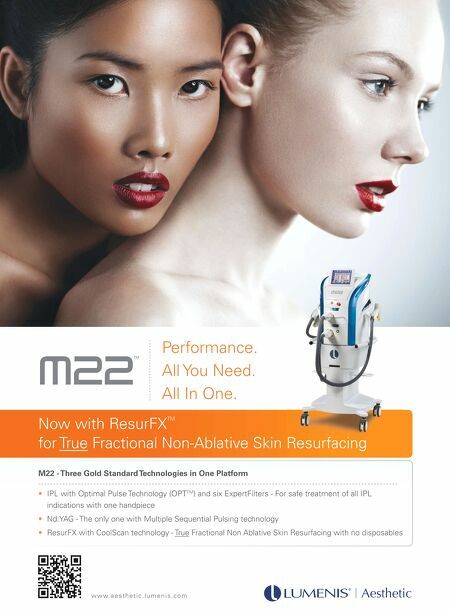 "Our new hair removal technology boasts the highest power of any light device in this class on the market. 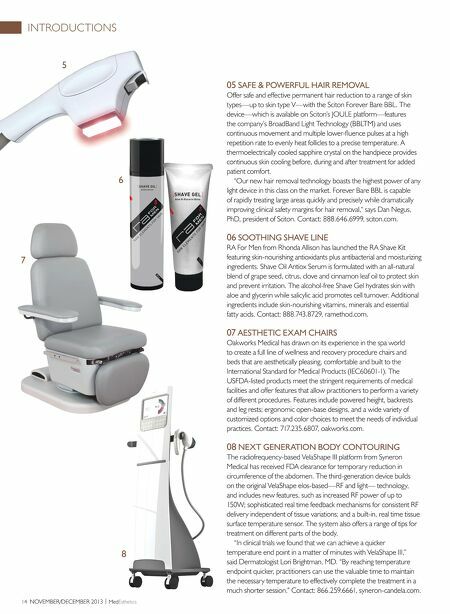 Forever Bare BBL is capable of rapidly treating large areas quickly and precisely while dramatically improving clinical safety margins for hair removal," says Dan Negus, PhD, president of Sciton. Contact: 888.646.6999, sciton.com. 06 SOOTHING SHAVE LINE RA For Men from Rhonda Allison has launched the RA Shave Kit featuring skin-nourishing antioxidants plus antibacterial and moisturizing ingredients. Shave Oil Antiox Serum is formulated with an all-natural blend of grape seed, citrus, clove and cinnamon leaf oil to protect skin and prevent irritation. The alcohol-free Shave Gel hydrates skin with aloe and glycerin while salicylic acid promotes cell turnover. Additional ingredients include skin-nourishing vitamins, minerals and essential fatty acids. Contact: 888.743.8729, ramethod.com. 7 07 AESTHETIC EXAM CHAIRS Oakworks Medical has drawn on its experience in the spa world to create a full line of wellness and recovery procedure chairs and beds that are aesthetically pleasing, comfortable and built to the International Standard for Medical Products (IEC60601-1). The USFDA-listed products meet the stringent requirements of medical facilities and offer features that allow practitioners to perform a variety of different procedures. Features include powered height, backrests and leg rests; ergonomic open-base designs, and a wide variety of customized options and color choices to meet the needs of individual practices. Contact: 717.235.6807, oakworks.com. 08 NEXT GENERATION BODY CONTOURING 8 14 NOVEMBER/DECEMBER 2013 | MedEsthetics The radiofrequency-based VelaShape III platform from Syneron Medical has received FDA clearance for temporary reduction in circumference of the abdomen. The third-generation device builds on the original VelaShape elos-based—RF and light— technology, and includes new features, such as increased RF power of up to 150W; sophisticated real time feedback mechanisms for consistent RF delivery independent of tissue variations; and a built-in, real time tissue surface temperature sensor. The system also offers a range of tips for treatment on different parts of the body. "In clinical trials we found that we can achieve a quicker temperature end point in a matter of minutes with VelaShape III," said Dermatologist Lori Brightman, MD. "By reaching temperature endpoint quicker, practitioners can use the valuable time to maintain the necessary temperature to effectively complete the treatment in a much shorter session." Contact: 866.259.6661, syneron-candela.com.